This ain't for PBR or Fat Tire Ale, but hopefully with other mainstream commercials featuring bicycles in a positive light, this Miller High Life will encourage more people to ride for health, for fun, to save money, or just to be empowered. I have a friend who for 30 years did not know how to ride a bike. This summer she took a class offered by the San Francisco Bicycle Coalition. Just one month after the class, she bought her own bike and is really enjoying it. The Interbike Trade Show is going on right now and Soma is not showing. We have people there meeting with distributors and the usual suspects, but we haven't done the $20,000 Vegas song and dance for a few years now. One reason is we can't seem to do our product releases all at once like most companies. 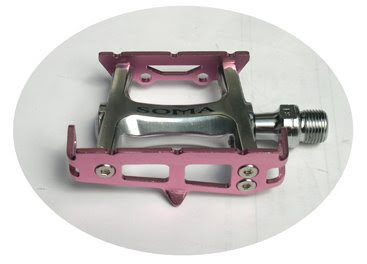 Our guys at Interbike will be telling our distributors we will have these "five things" coming out in the spring...then maybe at the annual Christmas dinner after a couple of pints someone will blurt out "pink pedals to match our pink toe clips!" or something and we'll end up doing those and a couple more projects. It's not necessarily prudent, but that's just the way we are and that is why I will alway have things to blog about each month. 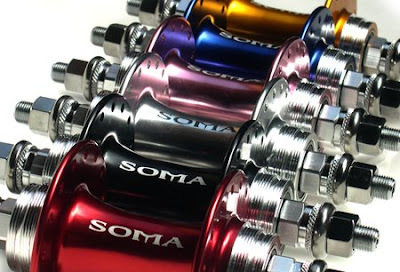 NEW PRODUCT RELEASE: Soma Somax Track Hubs and Hellyer Track Pedals are now available in anodized colors beyond black and silver. Gold, pink, red, and blue. The pink pedal isn't designed to go with our hot pink toe clips (oh well), but they'll look "smashing, baby" with the chrome or white clips. We promise to have Somax wheels in colors in a few months. You may have seen this already on some blogs, but it is now officially in the U.S. The Gran Compe Shot Lever is a novel lever design that allows the rider to brake with either hand. Official word is that it is a "sub lever" which I gather means don't expect it to be as powerful as normal levers. One warning: Do not try to pull both levers at once. It isn't designed to work that way. Dealers: These are available at distributor Merry Sales now. We expect to get these on the Soma Store next week some time. Price will not be cheap: $69.95. In black or silver. The piece of coiled metal cable housing is included. 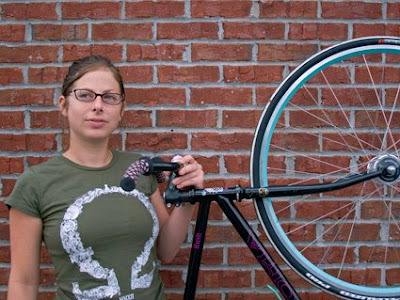 Rachael Spiewak, director of ATL's Sopo Bicycle Cooperative recently got featured on the Epidemik Coalition site. It has a nice photo with her and her Soma Rush. I like her shirt. Soma is working on t-shirts and I think that might be one of the colors we'll do. Follow the link to the article. Check out the Sopo site, too, if for nothing else, but to check out the fluffy bike riding sheep. 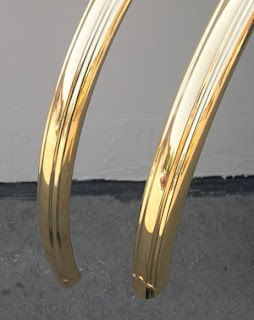 We recently got a look at some pre-production brass Honjo fenders. Don't know when they will be available to U.S. distributors, but they sure look sweet. These are in the fluted style. The Soma Fabrications Users Group has been set up on Facebook. For those that ride Soma Fabrications bicycle frames or parts or just dig their steel core tire levers, we don't care.... you are welcome to join the group and meet other Soma users. You can create discussions in the forum, but of course now there is no one there, so it might be lonely. You can also be among the first to show off pictures of your Soma build. Keep the posting wall and forum 'sucker free' and don't rock the boat and we will get along just fine. If you have something that you want Soma to respond to directly please email them, do not post here. We don't know how often we will be on FB, so if you have questions for us, please do not ask them of FB; send an e-mail instead (somainfo[at]somafab.com). For the curious, you can't just check it out. You need to be logged in as a Facebook member to find it. Sorry. That's how FB works.